Friday August 23 1907 I put corn to dry in the forenoon and cared for it in afternoon and sewed a little. Hattie telephoned me that Nellie & Ida were to come tonight. 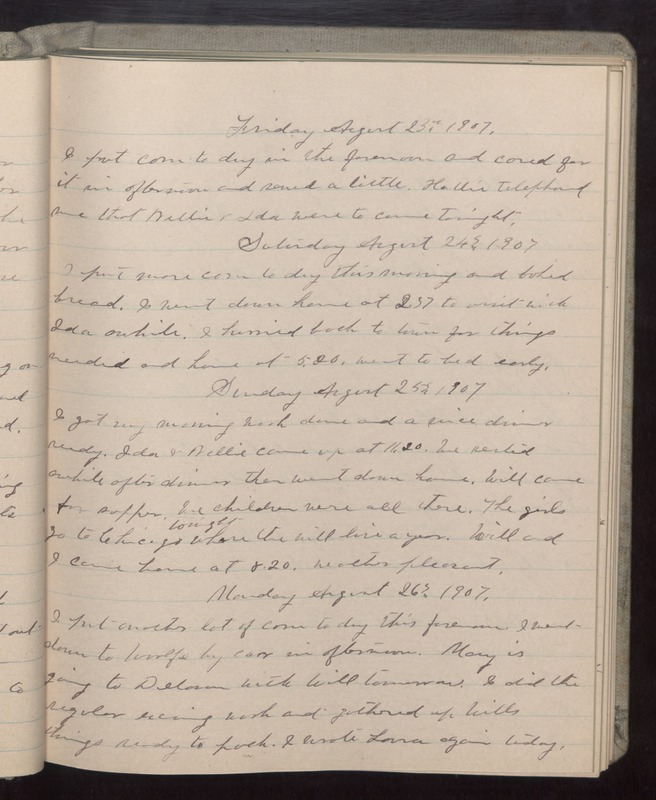 Saturday August 24 1907 I put more corn to dry this morning and baked bread. I went down home at 2.37 to visit with Ida awhile. I hurried back to town for things needed and home at 5.20. went to bed early. Sunday August 25 1907 I got my morning work done and a nice dinner ready. Ida & Nellie came up at 11.20. We rested awhile after dinner then went down home. Will came for supper. We children were all there. The girls go to Chicago tonight where the will live a year. Will and I cam home at 8.20. Weather pleasant. Monday August 26 1907 I put another lot of corn to dry this forenoon. I went down to Woolfs by car in afternoon. Mary is going to [Deloran?] with Will tomorrow. I did the regular evening work and gathered up Wills things ready to pack. I wrote Lorna again today.